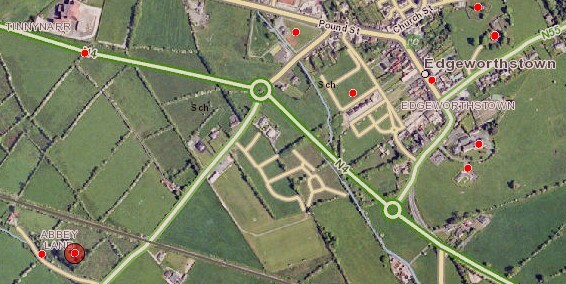 The site is just south-west of Edgeworthstown (Abbeyland) and there are no major remains. The friary of St. John the Baptist of Longford began life as a Third Order Regular friary in the fifteenth century. The First Order got permission to take it over in 1635. The friary was plundered by the Earl of Westmeath in 1651, but the friars had returned to the area by 1658. As late as 1801 there were still four friars there. The end probably came with the death of Fr. Thomas McCormick in 1811.